Recorded at the decommissioned Blue Wave Productions which was an amazing studio with a medium size diffusion room. This means that you could get that huge room sound, but still get nice dry overhead mic sounds. The perfect combination. The cornerstone of the studio was a meticulously maintained vintage API 2488 console. The preamps were unbelievable with the signature API sound which we abused during the tracking of this library. 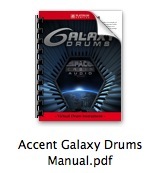 Galaxy Drums is the first sample library created by Space Cabin Audio. This ground-breaking drum library encompasses heavyweight studio drum tones and an extensive depth of dynamics with acute sensitivity and attack. Galaxy Drums includes two, four-piece drum kits, 4 snares, 2 HiHats, 3 crash cymbals, 2 ride cymbals, a china, and a splash cymbal. It also comes with a Cowbell and Hand Claps. The kits recorded were chosen for their superior tonality and versatility. With the choice of a vintage maple drum set and a custom stainless steel kit this collection provides a variety of massive toms and punchy warm bass drum opportunities. The four highly sought after snare drums create options for different metal and wood snares that give you the advantage of finding the perfect accompaniment for your specific musical requirements. With a wide range of tones that vary in color and attack, you have the ability to script the ultimate combination to accomplish the perfect accents. 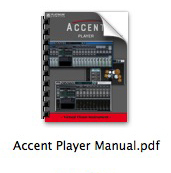 The samples are formatted for Platinum Samples Accent and are available at 48kHz/24 bit. Ludwig LM 402 Supraphonic: 14 x 6.5"
Dunnett Custom Classic Stainless Steel: 14 x 6.5"
Yamaha Manu Katche Brass: 14 x 5.5"
Ludwig Coliseum Chrome Over Wood: 14 x 8"
AAX is a registered trademark of Avid Technology, Inc. Audio Units is a registered trademark of Apple Computer. This product requires downloads in excess of 14 GB.